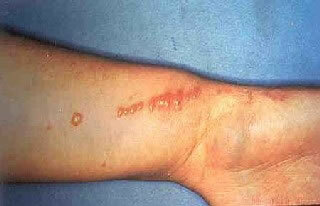 The oil from the plant leaves irritates the skin. 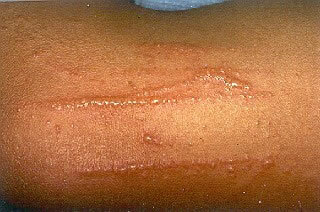 The redness and blistering from the rash often appears in streaks or lines, because the leaf brushes across the body in a line as a person walks past. The redness and blistering from the rash is often arranged in streaks or lines, because the leaf brushes across the body in a line as a person walks past. 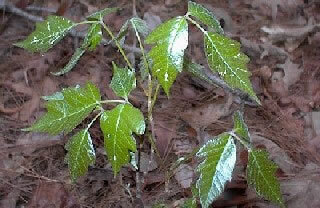 Poison oak can grow on a tree or a vine. The leaves look wavy and grow in groups of threes. 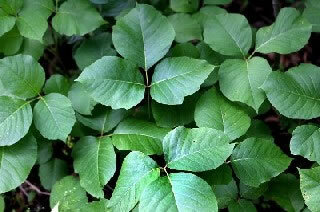 Poison sumac can have groups of 6-12 leaves. Each stem has leaves growing across (parallel) from each other. Young plants are red or red-brown. 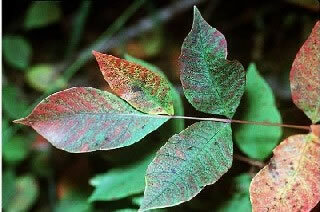 As a poison sumac plant grows older, the leaves will become brown or grey.